You are at:Home»Culture & Custom»Geography»Do You Know National Flowers of Japan? Cherry Blossom and What is the Other One? In Japanese history, the emperor has been played very important roles. Nowadays, he doesn’t have political power anymore. However, he still has huge influence to Japanese people. For example, chrysanthemum crest was impressed on the bow of Japanese battle ships because they were emperor’s properties. 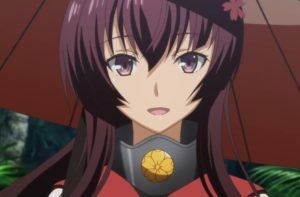 However, on today’s Japanese animes like Kantai Collection and High School Fleet, they use other flowers like cherry blossom for the crest. 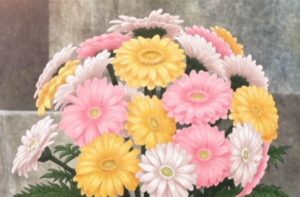 Anime creators don’t use chrysanthemum as crest because of their respect to the emperor. As you can see from those facts, Japanese people respects the emperor very much. On this article, I explain about the national flower, chrysanthemum and the emperor of Japan. I also explain the relationship between the emperor and Japanese people, and how important the emperor system for us. I will try to explain those topics from the point of view that has lived Japan for more than 30 years as Japanese citizen. I hope this will help you to have deep understanding of people and nation of Japan. I knew cherry blossom is the national flower of Japan. But I didn’t know about chrysanthemum. Is chrysanthemum is only used by the imperial family? Chrysanthemum is symbol of the imperial family. But we also use it on our daily lives. On this chapter, I will explain how Japanese people use cherry blossom and chrysanthemum. There’s no official national flower of Japan decided by law. However, if you ask Japanese people, most people would answer cherry blossom and chrysanthemum as national flowers. Why cherry blossom and chrysanthemum is recognized as flowers of our nation? How do we use those flowers? Cherry blossom is very popular flower for Japanese people. There’re some reasons why Japanese people love it. 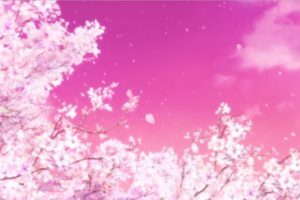 A simple reason is that cherry blossom is so beautiful with the color of pink. It’s not only beautiful when it blooms, but also beautiful when it falls from trees. Cherry blossom blooms only short period of time. In Japanese culture, it’s considered as the beauty of gracefulness. 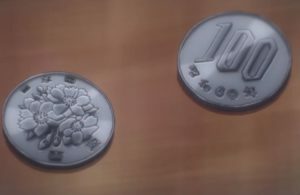 This image from “Erased” shows that cherry blossom is drawn in Japanese 100 yen coins. 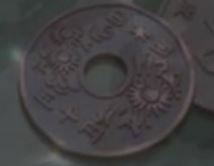 If you have this coin, I want you to see the cherry blossoms drawn on it. We also have a big event of cherry blossom. It is called “お花見” (おはなみ, Ohanami), cherry blossom viewing party. If you translate “お花見” literary, it means “flower viewing.” As you can see from it, cherry blossom represents all flowers for Japanese. During the season of cherry blossom, we hold the party under cherry trees with family, friends, or colleagues. It’s like a picnic. We have the party not only during daytime but also some people hold until late night to enjoy drinking alcohols. This image from “New Game! 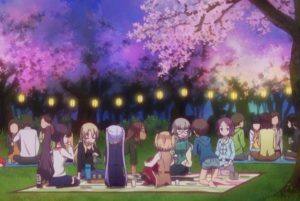 !” is a scene where the game company’s people hold cherry blossom viewing party. A cherry blossom viewing party is often held as a welcome party for new employees because they enter the company in April. In Japan, spring is the season of graduation and entering new schools. 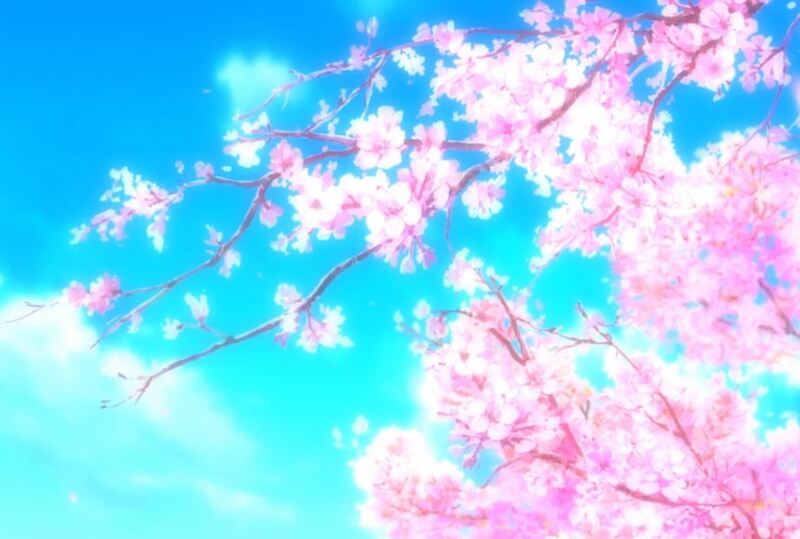 Therefore, cherry blossom is also the symbol the season of meeting new people and leaving the old. There’re many songs about cherry blossom. If you ask Japanese friends about cherry blossom song, they would tell you at least several songs. Some may tell you more than 10 songs. 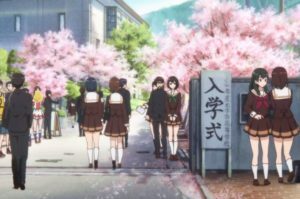 This image from “Euphonium” shows that the school entrance ceremony is held in April when cherry blossoms are blooming. Chrysanthemum isn’t as popular as cherry blossoms in Japan. The flower language of chrysanthemum is “nobleness”. It’s more for special occasion and target of respect. For example, we use chrysanthemum as flower for funeral. 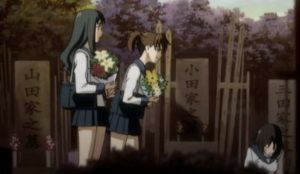 This image from “Ga-Rei: Zero” is a scene where students are giving chrysanthemums to their teacher ‘s grave. Chrysanthemums have various colors such as yellow, white and red. At some regions, people eat flowers of chrysanthemum. It’s herbal medicine for longevity. You can find chrysanthemum in art, too. There’re dolls made from colorful chrysanthemum flowers. It’s called as “菊人形” (きくにんぎょう, Kikuningyo) in Japanese. You can also find chrysanthemum in historical famous pictures and “俳句” (はいく, Haiku), Japanese poetry. This image from “The Eccentric Family” shows that chrysanthemum is drawn in Japanese 50 yen coins. Is crest of chrysanthemum is only used by the imperial family? Actually, there are some other groups. But the shapes of crests are different. I will explain the history of the imperial crest and also about the shapes of crests. As I’ve explained, the emperor and the imperial family have used chrysanthemum as their crest for a long time. Why Japanese imperial family use chrysanthemum as their symbol? The history of chrysanthemum as the imperial crest dates back to the Heian period in 12th century. “後鳥羽天皇” (ごとばてんのう, Gotoba-tenno), the 82th Emperor Gotoba was the first emperor to use chrysanthemum as his crest. He loved chrysanthemum and put the crest on his swords, clothes, and other goods. Then emperors after Emperor Gotoba continued to use the crest. Then it became the imperial crest of Japan. The imperial crest is “十六八重表菊” (じゅうろくやえぎく, Juroku-yaegiku), eightfold chrysanthemum with 16 petals. 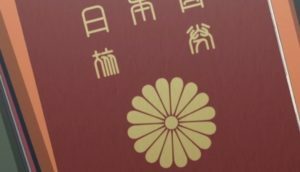 Chrysanthemum is also used for other purpose such as the badge of the National Diet members and the emblem of the Liberal Democratic Party (LDP). 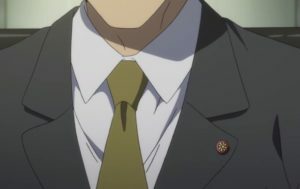 The shape of the Diet member’s pin is “十一菊” (じゅいちきく, Juichikiku), chrysanthemum with eleven petals. The emblem of LDP is “十四陰菊” (じゅうよんかげぎく, Juyon-kagegiku), chrysanthemum with fourteen petals facing down, and Japanese name of the party on it. A real National members badge has 11 petals and a real city council members badge has 10 petals. This image from “Erased” shows that the city council members badge has 8 petals. 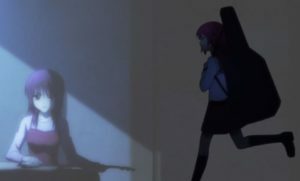 I respect that the creators reflect the difference between animation and reality to such details. The numbers of petals for emperor’s crest is 16, but petals for other crest are usually less than 16. In 1868, the government established law that only the Emperor and his family can use Juroku-yaegiku. It prohibited people to use it. At the time, the Emperor was the persons in paramount authority, and was believed to be a living God. Therefore, no one should be above him. After World War II (WW II), the law was expired and today everyone can use the crest of the chrysanthemum freely. However, Juroku-yaegiku is still only used by the imperial family. It’s because people still admire the emperor and his family. It’s also unable to register as trademark. Today, we still see the crest of chrysanthemum. For example, you can see it on the cover of Japan’s passports. This image from “A Certain Magical Index II” is a scene where Toma Kamijou is preparing a passport to go to Italy. You can also see it at “靖国神社” (やすくにじんじゃ, Yasukuni-jinjya), Yasukuni-jinja Shrine. Yasukuni-jinja Shrine is the shrine which enshrine the war dead. This image from “Zipang” shows that Japanese battleship “Yamato” has the crest of chrysanthemum attached. 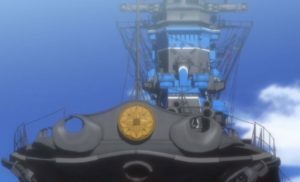 The crest of chrysanthemum is faithfully reproduced because this work is a real battleship anime. I’ve heard that the emperor is just a symbol of the State now. Does he still have influence in Japan? It’s true that he doesn’t have political power anymore. But many people still respect him. He’s very special for Japanese people. On this chapter, I explain how the relationship between the emperor and people has changed in history. Before the war, Japan was constitutional monarchy. As I mentioned, emperors used to have absolute power. Since emperors were believed as living God, people weren’t allowed to even look at his face. During the war, the emperor sometimes spoke to people through radio. 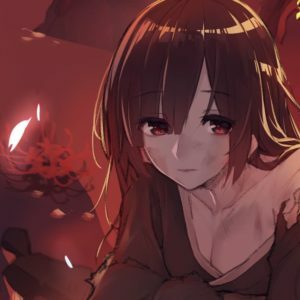 The radio was called as “玉音放送” (ぎょくおんほうそう, Gyokuon-hoso), Jewel Voice Broadcast. When people listened the radio, they threw themselves on the ground. My grandparents have told me that people hesitated to say the word of “天皇陛下” (てんのうへいか, Tenno-heika), which is Japanese term of respect “the emperor”. When Japan lost WW II in “昭和” (しょうわ, Showa) Era, the emperor has lost his political power. He became just a symbol of the state under the control of General Headquarters (GHQ). Many Japanese military officers executed as war criminals. It wasn’t only Japan, but most kings and monarch defeated countries are executed. But Showa Emperor, Hirohito, wasn’t executed. It was very rare case. There were some reasons, but it’s said that GHQ officers considered the emperor’s great influence for Japanese people. Although Japan lost the war and it caused huge number of victims, the emperor was respected by people. Therefore, GHQ officers were afraid that the death of the emperor may create mayhem. More than 70 years have passed from the lost the war. The emperor has changed to next generation. People still respect the emperor. When the emperor talks in front of people, people become so quiet. Although the emperor became just a symbol in political meaning, he still has huge influence to people. In Japan, we use unique names of era like Showa. Name of era is called as “元号” (げんごう, Gengo) in Japanese. The government change Gengo when the emperor dies and succeeds to next generation. We also use the Christian Era, but at offices and schools people often use the Japanese Era. Another example of the emperor’s influence is Japanese word “上京” (じょうきょう, Jyokyo). That means “go to Tokyo.” If you translate it literary, it means “go up to the capital.” It doesn’t mean Tokyo is geographically higher than other places. Since the emperor lives in Tokyo, we use the word “up” to respect. Today the emperor doesn’t engage in political decision. However, he has many public affairs. When natural disasters occur, he visits the area to encourage people. He also visits the areas that had war during WW I and WW II to pray for victims. Visiting war areas are one of his special jobs. If politicians like the prime minister go to those areas, some people might criticize them. Since Japan is a defeated country, war issues are very sensitive. But the emperor is still special being for Japanese. Therefore, no one argues about his visit to those places. The era is “平成” (へいせい, Heisei) now. Heisei Emperor, Akihito, is 84 years old (As of 2018). Under the existing law, the emperor abdicates only when he dies. However, Emperor Akihito spoke to people that he has a wish to abdicate the emperor before his death. Since he is very respected and loved, most people agree and support his wish. I understand how Japanese people respect the emperor. But is there any issue of the emperor? Of course, there’re some issues. On this chapter, I explain about those issues. One of the big issue is that the problem of succession. Under existing law, emperor must descent through the male-line. Also female isn’t allowed to be emperor. There are arguments to change the law and allow female member to be an emperor. Today imperial family has more female children compare to male. At the past, the emperor had concubines but they don’t anymore. Heisei Emperor has two sons and only a male grandchild. After his second son’s birth, it passed more than 40 years until his male grandchild, Hisahito, come to birth. If prince Hisahito won’t get a male child, no one will be able to be a successor. That’s the reason why people argue about female emperors. However, imperial family is considered as descendants of god and bloodline is very important. It’s not so easy to change the rule. Another big issue is about emperor’s human rights. Because of the lost in WW II, the emperor and imperial family’s rights are very limited. Firstly, they aren’t allowed to speak their political opinions. They don’t have voting rights. Secondly, the imperial family doesn’t have rights to change their religion because the emperor’s important role is priest of “神道” (しんとう, Shinto). As I mentioned prior, currently the emperor doesn’t be allowed to retire when he wants. Before the war, the emperor was considered as living God, but now people understand he is also human. Therefore, some people argue that the government should allow their human rights. I should add that there are also arguments in the emperor’s historical issue. Japanese people fought World Wars under the name of the emperor. Therefore, some people argue emperor’s historical responsibility. I want to know more about Japanese emperor. Are there any movies or TV dramas about the emperor? Oh, it’s good idea! But the emperor is very sensitive topic in Japanese society. So it is hard to find movies or dramas about the emperor, especially on recent works. The theme about the emperor isn’t taboo, but it’s very sensitive topic. Since the emperor is special in Japan, we must be very careful about the way to show him. There’re also people who are against the emperor system. Therefore, it tends to cause political arguments. 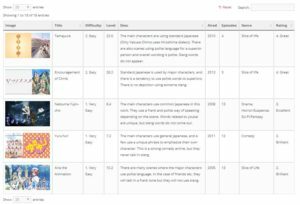 It’s easier to paint on animes about the emperor’s related topic compare to movies. It’s because people considered it as “fantasy.” Recently there are some animes like Kantai Collection and High School Fleet, which paint about battle ships. On those animes, they paint the crest on the bow of battle ships. They don’t use real the chrysanthemum crest but often change to other pattern, like the mix of chrysanthemum and cherry blossom. It’s not prohibited to use the chrysanthemum on animes or movies, but it’s consideration for the respect to the Emperor. 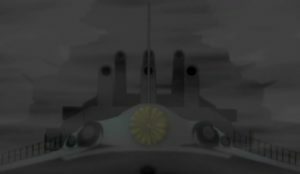 This image from “High School Fleet” shows that Japanese battleship “Musashi” has the other pattern of the chrysanthemum crest attached. This image from “Kantai Collection” is an anthropomorphic character of the battleship “Yamato”. Of course, she also has a different pattern one. Chrysanthemum and cherry blossom are national flowers of Japan. However, the meaning and role of the flowers are different. As I’ve explained, chrysanthemum is symbol of the imperial family and target of respect. It’s true that there’re many arguments about the emperor system and some people are against him. However, the emperor is very special being for most Japanese people. People respect him and also he encouraged people. Although he has no political power, he has huge influence as symbol of the State.